The impact spot is clearly visible in the top part of the windshield of the car that allegedly struck a Houston elementary school student on April 10, in this screen capture from an ABC 13 news report. 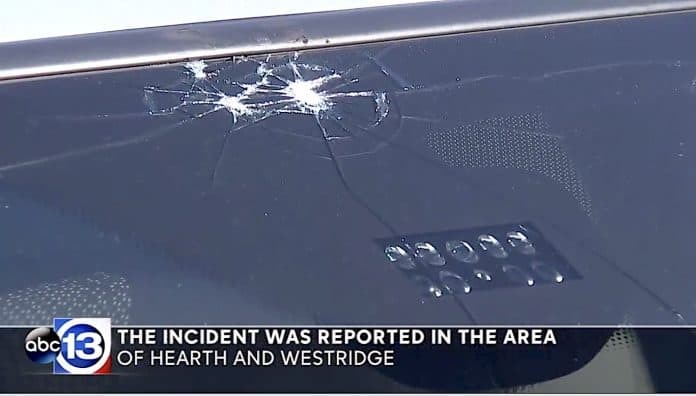 HOUSTON, Texas — A Houston elementary school student was hit by a car on April 10 in the middle of an intersection, after the car allegedly drove around a school bus that was stopped with its red lights flashing, Houston police said. Houston Police said the approx. 3 p.m. accident “could have been avoided,” reported ABC 13. The child was immediately transported by paramedics to a nearby hospital, news reports said. No further details about the status of the victim have been released. The incident is still being investigated. Police related that a woman drove around the stopped school bus while it was unloading passengers, and disregarded the flashing red lights. Just one month before that, on March 7, the driver of a Houston ISD school bus hit and killed a bicyclist “who inadvertently slid under the vehicle … while trying to avoid a collision,” reported the Houston Chronicle.